← Research on academic blogging: what does it reveal? 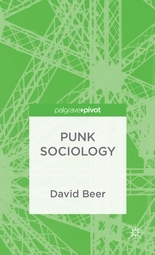 David Beer’s Punk Sociology reviewed by Deborah Lupton. Pingback: The Public Realm | Did you hear what he said?!? Here’s your afternoon blogroll!!! Sounds interesting, even though I am a little afraid that what is called Punk Sociology might turn out to be Hippie Sociology. Postmodernist sociologists often reminded me of Jazz Snobs. If it’s any consolation, Sebastian, I wouldn’t call Dave Beer a postmodernist!